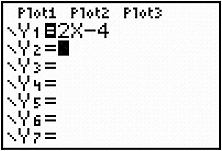 You can also use the table feature on your graphing calculator to find solutions to linear equations and inequalities. Let's say that you are asked to determine if (-3, 8) is a solution to 3y + x = 7. Remember that first we will need to write the equation in y = form. 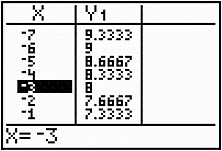 Look at the table for this equation by pressing to access the and scroll up the table until you see an x-value of -3. Our table shows that when x = -3, y = 8. So the ordered pair (-3, 8) IS a solution to the equation. Let's look at a linear inequality next. Is (-1, -6) a solution for 4x − 2y > 8? 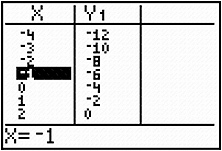 Look at the table for this equation by pressing to access the and scroll up the table until you see an x-value of -1. Our table shows that when x = -1, y = -6. REMEMBER: we are solving an inequality. So we need to ask "Is y < 2x – 4?" So (-1, -6) is NOT a solution to the inequality. Use the Table feature on your calculator and determine if the given ordered pair is a solution to each linear equation or inequality. Is (-1, -1.5) a solution for y < one-half 1 2 x + 3? 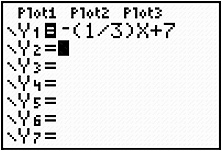 Is (3, 4.5) a solution for y < one-half 1 2 x + 3? Is (-14, -10) a solution for 7y = 4x − 14? When you are finished, click below to check all of your answers.